Beirut (AFP) – At least 30,000 civilians have fled fighting between jihadists and rebels in northern Syria in the past 48 hours, Human Rights Watch said, calling on Turkey to open its border to them. The watchdog accused Turkish border guards of shooting at some of those displaced in Aleppo province by fighting between the Islamic State (IS) group and rebels as they approached the frontier. “As civilians flee ISIS fighters, Turkey is responding with live ammunition instead of compassion,” said HRW researcher Gerry Simpson, using another acronym for the jihadists. HRW said many of those who fled were residents of emergency camps set up along the border who headed for other camps or nearby towns and villages even though they were still unsafe. The UN Office for the Coordination of Humanitarian Affairs (OCHA) meanwhile estimated that up to around 23,000 displaced people had fled the IS offensive in northern Syria. It said many displaced were now “in close proximity to frontlines and therefore extremely vulnerable to further escalations”. It comes as escalating fighting between Russian-backed regime fighters and rebels around the provincial capital Aleppo further south threatens a nearly seven-week ceasefire that had seen violence drop significantly for the first time in the five-year conflict. 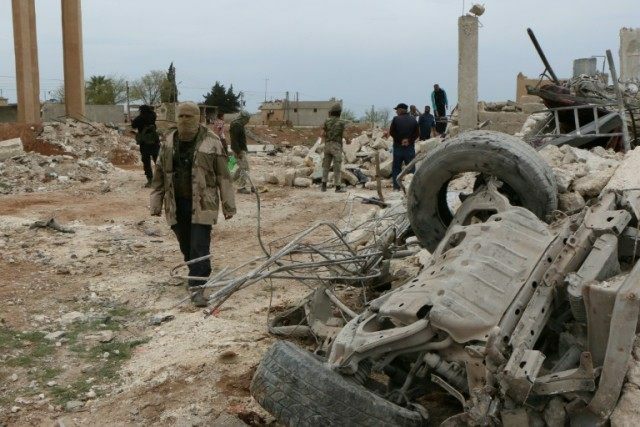 IS and other jihadist groups are excluded from the truce. Representatives of Syrian President Bashar al-Assad’s regime are expected in Geneva on Friday for the latest round of talks aimed at ending the war, which has killed more than 270,000 people and displaced half the population.